In a home sale and purchase agreement, financing contingency refers to a clause that expresses that the offer is contingent on the buyer securing financing for the property. A financing contingency provides the buyer with protection from potential legal ramifications in case the deal fails to close. Markets vary in the demand for property and its availability. The existence of contingencies differs depending on the status of a given marketMarket EconomyMarket economy definition - a pure market economy is an economic system where there are no regulations and players are free to trade as they please. In a market with a huge demandLaw of SupplyThe law of supply is a principle in economics that an increase in the price of goods sold will have a corresponding direct increase in supply by producers for properties, the sellers pick the offer with fewer stipulations and contingencies. On the other hand, if the demand is low, the seller faces fewer options and may, therefore, choose an offer regardless of the number of contingencies. The seller also considers the value of an offer and may prefer to take a higher offer with more contingencies. The seller becomes the determining factor, especially in cases where there is high demand for their prime property. The seller must weigh the stipulations, contingencies, and the value of an offer to sell their property. An offer to buy a property will often contain several contingencies concerning appraisal, financing, and other factors. The buyer should also be aware that there are other competing offers for the same property. A buyer may choose to overlook their right to ask for an appraisal or financing contingency if it raises their probability of being chosen by the seller. Buyers should be aware of the financial risksSystemic RiskSystemic risk can be defined as the risk associated with the collapse or failure of a company, industry, financial institution or an entire economy. It is the risk of a major failure of a financial system, whereby a crisis occurs when providers of capital lose trust in the users of capital such moves bring on board. Competing for the property is healthy but exposes the buyer to obvious and some unforeseen challenges. For instance, waiving a financing contingency would deny the buyer the help of a financier in the purchase of a house. Some contingencies are also mandatory according to existing laws, which means that overlooking them may attract a lawsuit. Buyers also risk losing their earnest money and more far-reaching consequences. The wording of the clause in the offer is paramount and can mean the difference between making a killing in a bid as opposed to facing severe financial risks. Earnest Money is a down payment on a property placed when a buyer submits an offer to a seller. The down payment is common with buyers as a way of showing commitment and interest in the property purchase. Earnest money is not mandatory, but many buyers use it as a convincing stance to the seller in the quest to get them to choose their offer as opposed to a competitor’s offer. The amount ranges from 1% to 5% of the sale price. It is often presented in the form of a cheque. The funds are first held in an escrow account or by the real estate agent until the seller accepts the offer. In case the buyer is unable to complete the purchase, the money is returned to them. A financing contingency shields the buyer if they are unable to secure financial support. It is usually detailed on matters concerning financing, and it is specific concerning all predictable conditions and stipulations. The main aim of a financing contingency, however, is to shield the buyer from being penalized in the event that they are incapable of completing the purchase when they already won the bid. The existence of a financing contingency differs depending on the status of a given market. The financing contingency contains clauses that specify the date of the completion of the transaction. The contingency also highlights expected instances and the resultant events. For example, if the buyer is unable to secure funding in time, the contingency requires that the held earnest money be refunded to the buyer with no deductions. The clause also stipulates that the buyer is not liable for any obligations if they fail to secure funding. Since the financial contingency shields the buyer from certain financial obligations arising as a result of their lack of capacity to obtain funding, the seller is required to be careful. The seller should investigate the buyer’s ability to complete the transaction promptly before accepting any offer. In case the buyer fails to complete a transaction, the seller loses valuable time and energy, as well as other offers posted by other buyers. It is, therefore, important that the seller chooses an offer where they are sure that the buyer is most likely to complete the transaction. A Letter of IntentLetter of Intent (LOI)Download CFI's Letter of Intent (LOI) template. An LOI outlines the terms & agreements of a transaction before the final documents are signed. The main points that are typically included in a letter of intent include: transaction overview and structure, timeline, due diligence, confidentiality, exclusivity is a term sheet that initiates the process of an offer from a buyer to the seller. 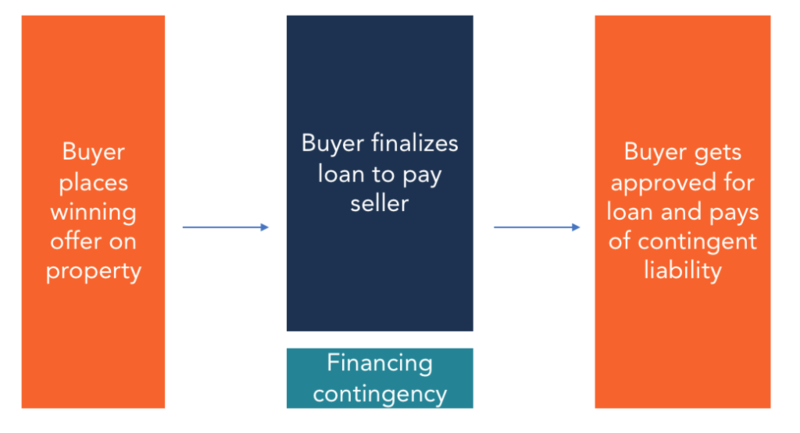 A financing contingency is a clause found in the LOI laying out the basis for cushioning a buyer from losing their earnest money as a penalty for not completing the purchase or being sued for damages, especially by the seller. In the case where a buyer is sure of their financing status, it is advisable to waive the financing contingency to be highly competitive in the bid for the property. The financing contingency also allows enough time for the buyer to secure financing. The seller cannot cancel the buyer’s offer in case of delayed funding. Therefore, using a financing contingency is safer for a buyer throughout the process of purchasing a home. It is also not necessarily disadvantageous for a seller to choose an offer with a financing contingency. The offer might be worth the wait even in the event of delayed financing. Thank you for reading CFI’s guide to financing contingency. CFI is a global provider of financial modeling courses for finance and accounting professionals. CFI also offers a Financial Analyst Certification program for those looking to take their careers to the next level.